Pesto pucks are great way to add a burst of flavor to soups, sauces and pastas. Learn the simple secret to making them at home with Filippo Berio Olive Oil. 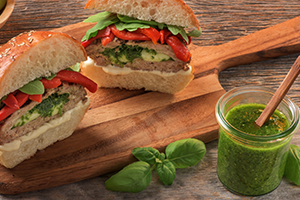 How do you get pesto into a burger? Make your own Pesto Pucks! Here’s how. Start by adding three cups of packed, fresh basil to a food processor. Then add a third of a cup of grated Parmesan cheese, along with garlic and toasted pine nuts. Pour half a cup of Filippo Berio Extra Virgin Olive Oil on top, and a quarter teaspoon each of salt and pepper. Pulse until the mixture is smooth. Then divide the pesto evenly into paper-lined mini muffin tins and freeze. Once frozen, pop the pucks into a re-sealable plastic bag and break them out as needed! They’re a great way to add a burst of flavor to soups, sauces and pastas.